A car accident left Nick Scott unable to walk, but it didn't derail his competitive ambitions. He's become a shining light in wheelchair bodybuilding and an inspiration to lifters everywhere! It's easy to become jaded about stories of champion fitness athletes and bodybuilders who've overcome some sort of adversity. But once in a while, we're introduced to a man or woman whose struggle is so compelling, the odds so insurmountable, that it forces us to take notice and get inspired. The story of Nick Scott is one such account. An ordinary teenager, Nick had the usual aspirations of young men of his age: sports and girls. But his life changed on Aug. 17, 1998, when a tire blew out on his Buick Skylark. The car rolled over 5-1/2 times, ejected him, and then hit him in the back as a final indignity. He tells the story in the new video "Rising Up: The Story Of Nick Scott." In his hospital bed, Nick wasn't certain he'd ever walk again. Paralyzed from the waist down, he fell into a deep depression while his body weight eventually ballooned to more than 300 pounds. Coming back wasn't easy. But eventually, his resilient character began to fight back. "What's the one thing you gain from losing everything?" he asks. "It's perspective. Because it wasn't about if my glass was half empty or half full. I was just grateful that I had a glass." Slowly and methodically, Nick began to learn the skills he needed to start training again. He realized he could still bench big and do plenty else in the gym, and he saw his body weight creep down from 300 to a svelte 190. "It took me many years to accept who I am and be OK with who I am," Nick recalls. "We all have disabilities, but one of mine is visible. In 2006, Nick entered his first wheelchair bodybuilding competition. The outcome, he quickly realized, didn't matter. All that mattered was what he learned along the way. "I saw guys who were worse off than me who were completely shredded," he recalls. "My perspective completely changed." Now 34, Nick's goal today is to bring his passion for health and strength to others in need. 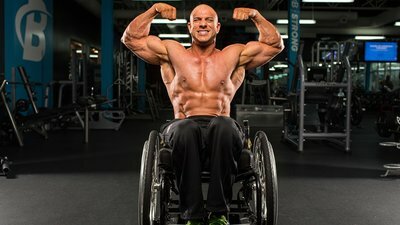 Besides helping to create the first pro wheelchair competition with Bodybuilding.com, he seeks to improve the lives of others affected by disability. "This has opened up doors, new opportunities to not just tell my story, but to give back, impact, inspire, and make a difference," he says. "Live your life fearlessly, and you can achieve anything you want."